I purchased and built this kit about 7 years ago but thought I’d offer it up as a sample of the type of modeling that I do. I’m a ‘wood’ guy doing work in plank on frame and plank on bulkhead models with a couple of resin submarines thrown in to break up the pace. 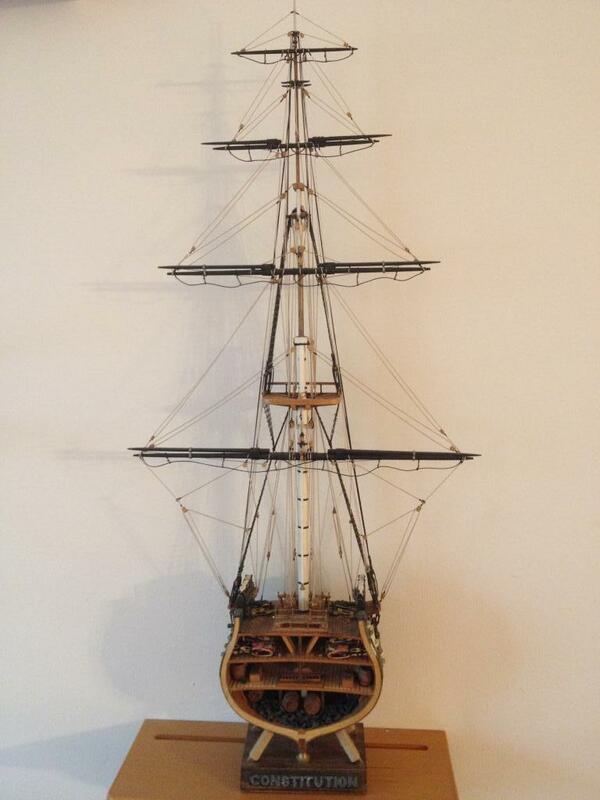 I’ve completed three wooden ship models; The Virginia Armed Sloop, The Constitution Cross-Section, and The Swift, a coastal trade ship. 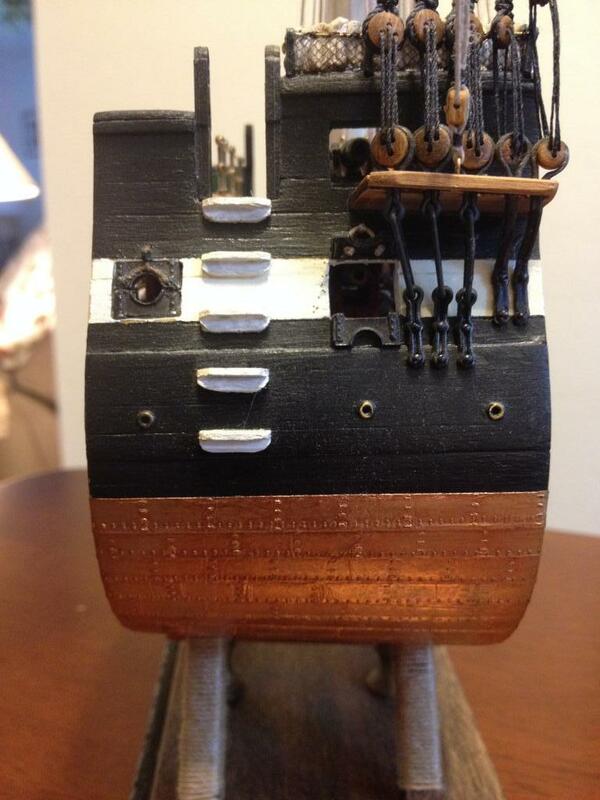 In progress includes the Model Shipways 1:76 scale U.S.S. 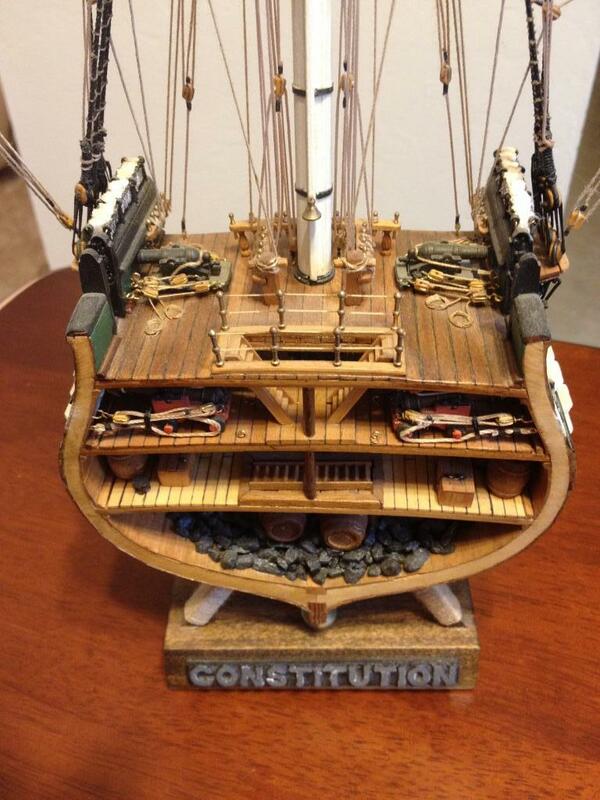 Constitution (48″ overall length, 37″ tall, 16″ wide), the Ictineo (the first truly submersible ship) a wooden submarine built before the U.S. Civil War Hunley / Alligator submarines by a self-educated Spanish schoolteacher, a 1/4 scale 10-frame cross section of the Bohomme Richard, and finally, my latest start is a solid wood hull model of the Lackawanna, a coastal tug that pulled coal barges for the Lackawanna Railroad Company. Estimated build times on these individual models run from 2 months (solid hull Lackawanna) to 2 1/2 – 3 years (1:76 Constitution). I enjoy the build and am in no rush to complete any of them because due to their sizes, I’ll have to find homes for them outside my own once completed. The cross-section was a quick build requiring only about 10-months of evenings and one day out of two each weekend. The instructions were translated from Italian and I’m sure the translator was taking out his anger toward the American jokes about the Italian military of WWII. The build was completed by simply assembling the 5 frames (two easy pieces each) on a common keel and then aligning them with spacer blocks that you cut from a provided piece of wood stock. I elected to toss out the original keel wood to incorporate a piece of history. While the grain is clearly not to scale, the wood I obtained was from the actual U.S.S. Constitution in Boston, MA. I purchased it through the Marine Detachment that sells removed wood during maintenance and upkeep. 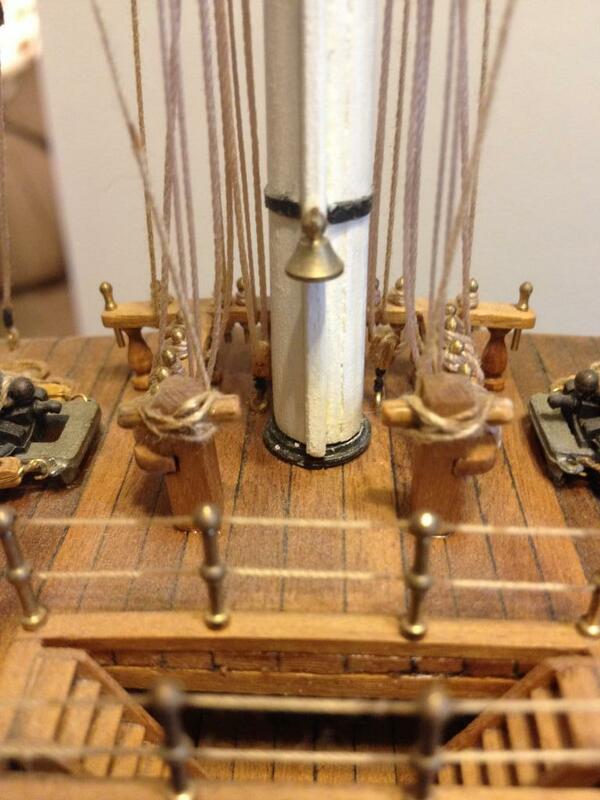 So, this model is truly built from the ‘keel up’ on a piece of living history. I placed the cannons / carronades in various positions from ‘just fired’ on recoil, to ‘ready to fire’ run-out positions and I placed two guns on the main gun deck in a ‘shipping’ position that you’d see them in while transiting. With the exception of the provided frame pieces, brass / metal pieces, all other items were fabricated, all spars were tapered by hand and all rigging was hand run based on provided plans. I elected to copper-plate the hull. I used copper strips from the 1:76 scale full length Constitution kit and used a ponce wheel (a metal wheel with evenly spaced spikes that dress-makers use to transfer patterns to cloth) on the backside to simulate the bolts that held the copper plates in place. I wasn’t pleased with the off-scale blocks so I sanded every one of them down by hand before installing. 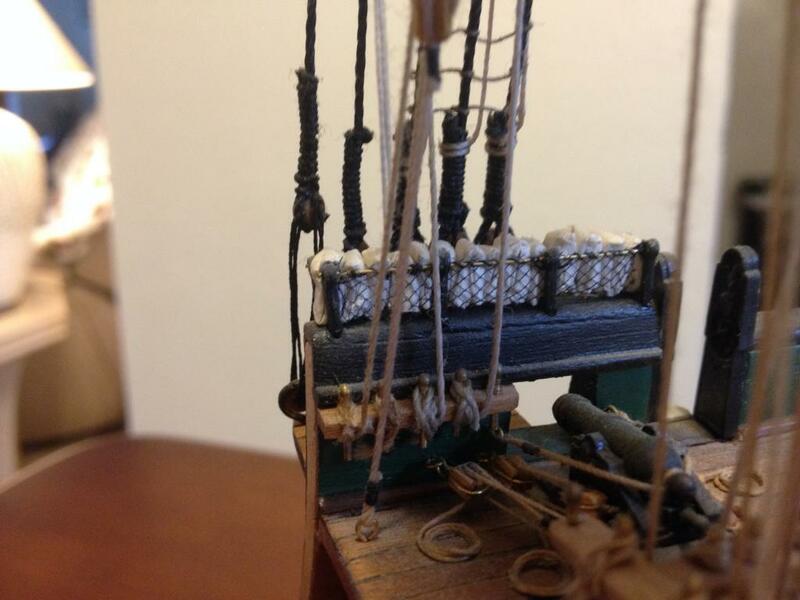 All knots were tied by hand and at last count there were over 580 individually tied knots on this model. I got into wood ship models because I simply couldn’t paint very well and found that the wood models are more forgiving of my lack of ability in that department. Geoffrey, unbelievable. I don’t think you need to worry about your painting skills. Looking forward to seeing the other ship models you are working on. Many thanks for your eye opening post! Thank You Robert, please call me Geoff. Still working on mine (Royal Caroline). The Royal Caroline is a great subject and very much a long-term project if you have a life! 🙂 Good Luck and thank you for your kind comments. Fantastic build there Geoffrey, you can actually see the details inside. Thank You Simon. It was fun to put together for sure. I recalled that the ships used stone for ballast and would vary the amount of stone with the amount of stores they kept aboard. I actually used aquarium gravel in a steel gray color to simulate the ballast in the hold. Used a watered down Elmer’s white glue in a water solution and just dumped the stones in and scooped them up and ‘stuck’ them in the hold from the sides. The amount of work you’ve put into these models, and the quality of your workmanship, is fantastic, thanks for sharing with us. Thank you George, even with the number of hours put in already, I’m still very much a novice. 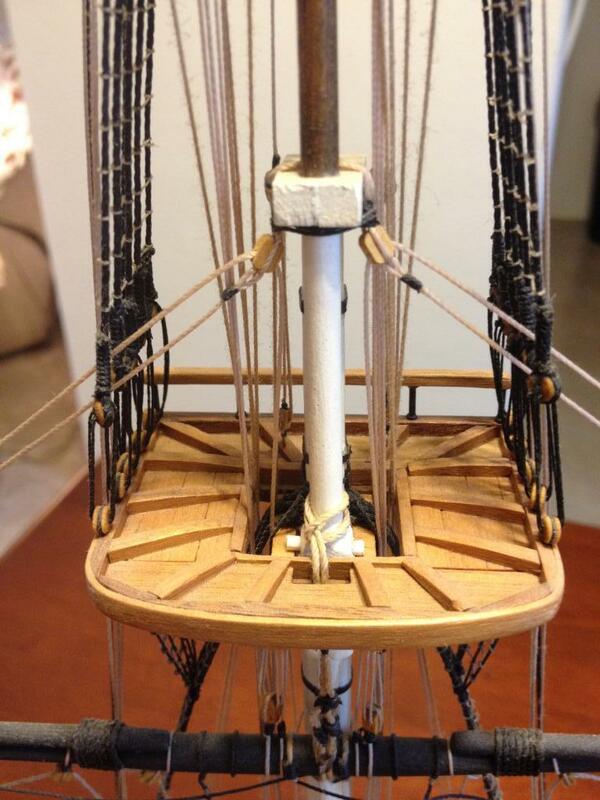 Model building is model building, no matter the medium, and I’ve always held in high regard those who have the talent and skill to pull a fully rigged ship off, let alone a wooden one. I like the cross section presentation! Looking forward to your full U.S.S. Constitution! Thanks Josh!!! I’ve been looking forward to the ‘big’ Constitution as well. Unfortunately, life stepped in for the last several years and I’ve just now gotten back to the modeling side of my life. I’ve missed it. I should post a shot of the Connie ‘as is’ right now. The last major task I had almost completed was hand-drilling over 2800 holes and then gluing in simulated bolt-heads that were used to reinforce and hold the bulwarks together on the original. It adds a great deal of detail to the model but it took several weeks of drilling those little holes and then putting in the ‘bolts’. The ‘bolts’ were actually HO scale railroad tie spikes. The guy thought I was out of my mind when I ordered 3000 of them. Beautiful model, Geoffrey! 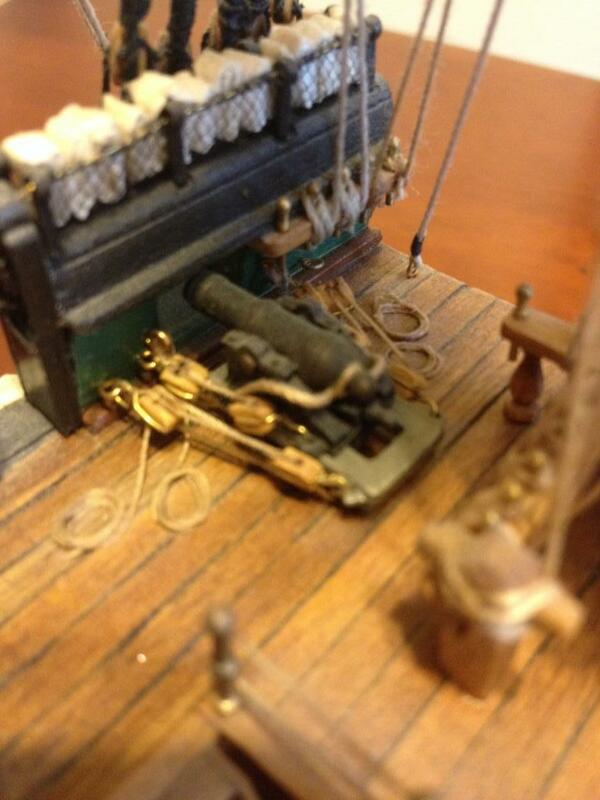 I am green with envy at your ability to model and rig wooden ships. If you are worried about your painting, then don’t be! If you have more ship photos to post, please do. Thank you Alan – I will definitely take some more photos of the completed models and some shots of the ‘in progress’ work. They all have something interesting to show and discuss. I very much enjoy the rigging of these models. They are extremely accurate with both the standing and running rigging and it’s a lesson in how the ships were rigged and actually sailed. The cross-sections naturally are missing any rigging that originated or terminated outside the scope of the cross-section length. I would never dream of attempting such an undertaking. Stellar workmanship, sir. If you post any further pics of this masterpiece, please include an item with which we can all relate for a comparison of size regarding the ship’s scale. I was very apprehensive when I put my first model together and my lack of skills showed. However, the model was relatively inexpensive (The Swift – less than $100) and at completion, I had some ‘skills’ but a larger vocabulary and a very good idea of what it was that I didn’t know. Each model, each step reinforces and provides confidence with a liberal dose of humility and an appreciation for the work of the masters of this type of work. Glad to see your work on this site. Beautiful model. Thanks Jack!! I heard Joe talking about this site at the last meeting and I thought I’d just get involved. There is some outstanding and highly skilled work here. See Tuesday!! Thanks Joe!! I heard about it from you!! Figured I’d just show up and start reading / contributing. I have the utmost respect for true ship builders like yourself. I know a few guys that do what you do and I marvel at all of your skill and patience. Great work. Thank You Frank. I’ll agree with the patience portion, I’m not so sure about the skill part – Hahaha – Slow and Steady seems to win the race with these models. If I screw up, I just build new parts. Thanks again!! HaHaHa – good comment Mike. Actually, it’s a ‘ship’ and not a ‘boat’ but they did carry stones in their holds when and if there was insufficient stored goods. It’s referred to as ‘ballast’ and was onloaded / offloaded depending what else was stored below. I made them ‘black’ / or ‘dark gray’ in color because the holds were usually filled with some water (bilge water) and the stones would turn black / dark gray due to mildew, mold and just general exposure to sea water that soon no doubt became rancid. Don’t you hate it when landlubbers refer to “ships” as a “boat”. Even worse, news readers on TV calling every naval ship (even if its an oiler) a “battleship”. I’ve visited the CONSTITUTION in Boston on a few occasions, it’s impressive in so many ways, the historic view or the “age of sail” view. I have this kit and I started it in 1997. I haven’t finished it due to other more pressing life events and the fact that 90% of the directions are in Italian (since I purchased it in Italy) and I don’t read Italian. Do you have the instructions in English? I have been searching the internet for them without any luck. I figured i would ask someone who has built it. Sorry – my plans too were in Italian. I used the pictures to get the gist of what I needed to do with the hull and I scratch built the carronade carriages from parts available from Model Shipways. 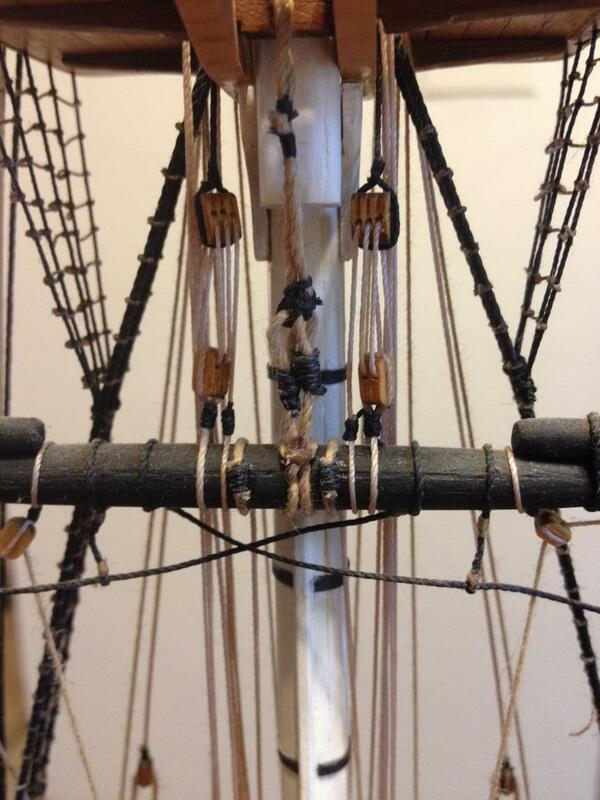 The masts & rigging was accomplished by again using the diagrams for ‘what goes where’ but the actual sequence of the mast & yardarm rigging was completed using a builders guide I had from Lauck Shipyard. It’s operated by Bob Lauck. He writes guides / practicums for various models and I used the one I purchased from him for the full-sized Model Shipways Consitution Model. It was my saving grace. I also deviated from plans with the ballasting, spare hammocks and netting materials and as I said, the cannons and carronades. Let me know if you have any other questions. I’ll only be too happy to help you out. The ‘as supplied’ model From Mamoli is ‘okay’ but with a few tweaks, it can become SO much more. Have a wonderful day and good luck to you.